A brand new experience of Airbnb in Canary Islands would permit six lucky guests to explore two of this summer’s most stunning astronomical events from a special vantage point. From July 27 to 31, Mars would come closest to earth as it had ever been in 15 years and July 27 would witness the longest lunar eclipse of the century. During this night, the six stargazers would enjoy this marvellous phenomena from the world’s largest single-aperture optical and infrared telescope in the Gran Telescopio Canarias (GTC) in Canary Islands, Spain. 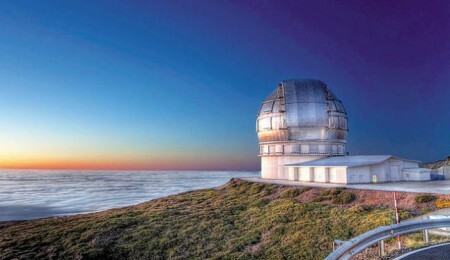 Guests would get a golden opportunity to visit this unique place along with astronomy experts Juan Antonio González, a regional astronomy guide and night photography expert and Antonio Luis Cabrera, chief of scientific operations of GTC. They would all be heading into the dome of the telescope and learn about the significance of dark-sky preservation. After midnight, the group will then head outdoors to observe and photograph the lunar eclipse with special equipment. Since the GTC is incredibly powerful, guests will view Mars through smaller telescopes in order to see the planet clearly from one of the best spots on the planet for stargazing. Airbnb is also partnering with Instituto de Astrofísica de Canarias, Gran Telescopio Canarias and Fundación Starlight to promote astro-tourism as a sustainable form of travel, bringing people away from the usual tourist spots and into more remote regions. Αναρτήθηκε από geop στις 4:51 π.μ.